Some of the events we hold are optional, but our Founder's Day celebration in the Fall, and our weekly chapter meetings are mandatory. Because we value academics highly, and believe that academics come first, we also monitor members grades to ensure they are on top of their school work.. We have many opportunities to play intramural sports in the Spring and Fall semesters, where we compete with and against other chapters! We hold events supporting our philanthropies each semester, and we also participate in other chapter's philanthropy events. We have many volunteering and service opportunities throughout the Spring and Fall semesters, which you can read more about on our Philanthropy page! What is the Legacy Policy? How can my daughter benefit from Sigma Kappa after she graduates? 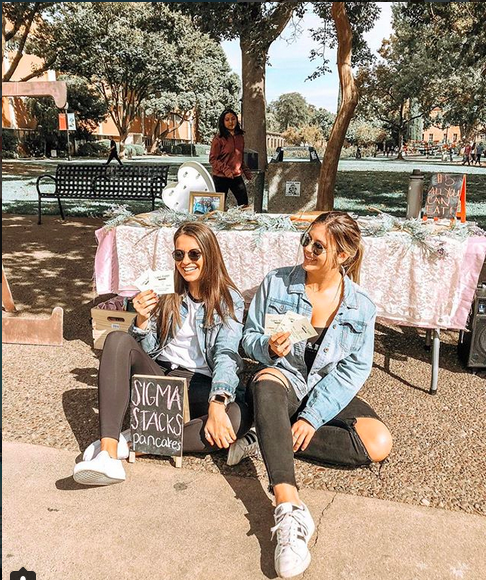 Sigma Kappa's vast alumnae network offers opportunities to stay connected to its values by offering volunteer opportunities within chapters all across the country and in your own town. Sigma Kappa volunteers are truly the heart of our organization. Our volunteer leader’s commitment to Sigma Kappa helps to ensure the longevity of the sorority and helps to create lifelong members of Sigma Kappa. In addition to our national headquarters staff, Sigma Kappa collegiate chapters are supported by our volunteers who serve as mentors and friends. Since our alumnae network extends far beyond the Chico area, it is always a possibility to run into another Sigma Kappa woman after your collegiate career is over. Our current members and alumnae both have incredible wisdom, personal and professional experience, and loyalty to one another that proves that joining Sigma Kappa is not only for 4 years, but for a lifetime. Are there punishments for not holding to the values of Sigma Kappa?